The free addition worksheets below are a fun way for your students to learn the basic math facts. Our son has brought similar papers home from school, they're often called "Funnel" or "Input Output" problems and just have a box with numbers on the left and one number in the middle. 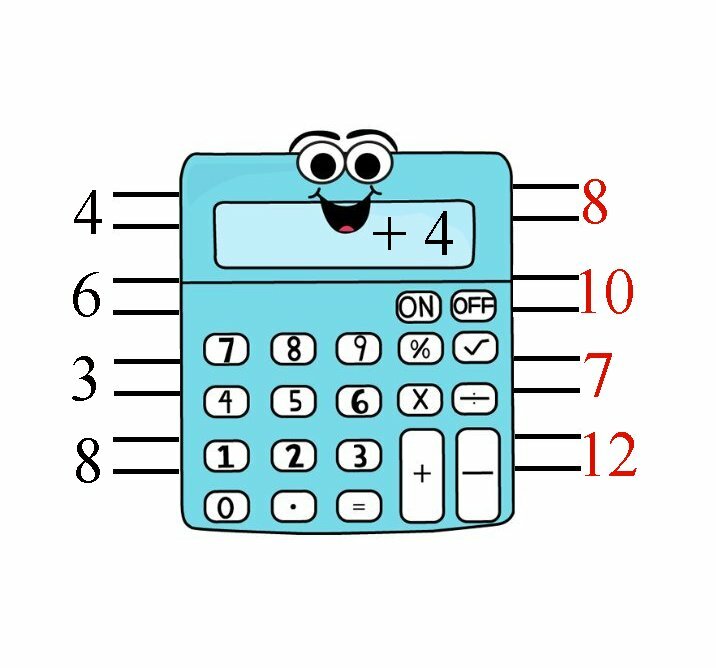 I thought the calculator graphic (from mycutegraphics.com) would be a bit more fun for kids and it works just as well. Numbers are funneled through the calculator on the left side, added to the number in the middle, and the fact is produced on the right side. These funnel problem worksheets cover addition facts from one through twelve. 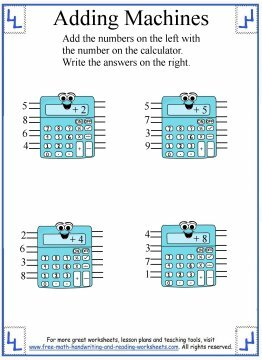 If your child is struggling with the answers, you might want to review my lesson covering the addition facts. For extra help, you can print out this addition table which can be used to discover any addition fact from one through twelve. Click the worksheets below to download them to your computer. You can print them out or use the template to create your own funnel problems for use at home or in the classroom. Each paper has instructions on it, but I've included more detailed instructions below. If you're new to funnel problems or just need more help with the papers, here are some instructions to get you going. Each printable is set up the same way. There are four calculators on each sheet. In the middle of each calculator is a plus sign and a number. For example, in the first sheet, the first calculator has a +2 on it. To the left of each calculator there are four digits. These are the numbers that you will be adding to the middle. Using the same example above you would have: 5+2, 8+2, 6+2, and 4+2. 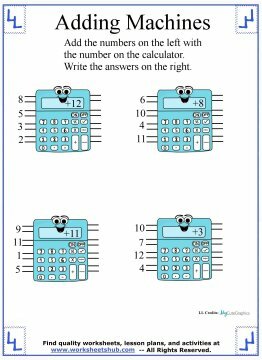 On the right are four blanks for your child to write the answers of each addition problem in. So for the example we've been using, your child would write 7, 10, 8, and 6 in the right column. You'll notice that the last worksheet has been left blank. I created a printable template that you can use to create your own problems--addition, subtraction, multiplication, or division. Here are a few more math lessons and games that you can use to help your child practice addition.